Grate the sweet potatoes into a large bowl. This is the hardest part of the recipe since sweet potatoes are so tough. Hang in there. In a small pan, heat 1 tablespoon of olive oil and add the leeks. Saute leeks for about 5 minutes over medium heat, or until they are softened and just start to brown (don’t let them burn). Add the leeks, eggs, salt, and pepper to the sweet potatoes, and mix well. Heat about 1 tablespoon of oil in a griddle, and fry the latkes in batches of ~4-6, depending on the size of your griddle. To form the latkes, grab a scant 1/4 cup of sweet potato mixture and squeeze the liquid out into an extra bowl. Form a 3-inch rough patty, and place it on the griddle. Cook about 3-5 minutes per side, until each side is nicely browned. Try not to flip these too many times – figure out how long it needs to cook per side, and flip only once. Set aside while cooking the rest of the latkes. I found that the easiest way to form latkes is to use a 1/4 cup sized ice cream scoop that has a squeeze release mechanism. Scoop up some sweet potato mixture, squeeze the water out into an extra bowl, and release the sweet potatoes into the griddle. Carefully flatten the latke with the back of the ice cream scoop. For the yogurt topping: Combine all the ingredients for the sauce in a small bowl and mix well. Serve over Sweet Potato Latkes. 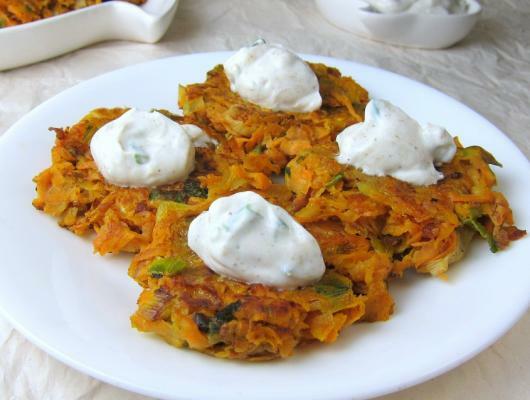 These Sweet Potato Latkes are a great twist on the traditional potato latkes. 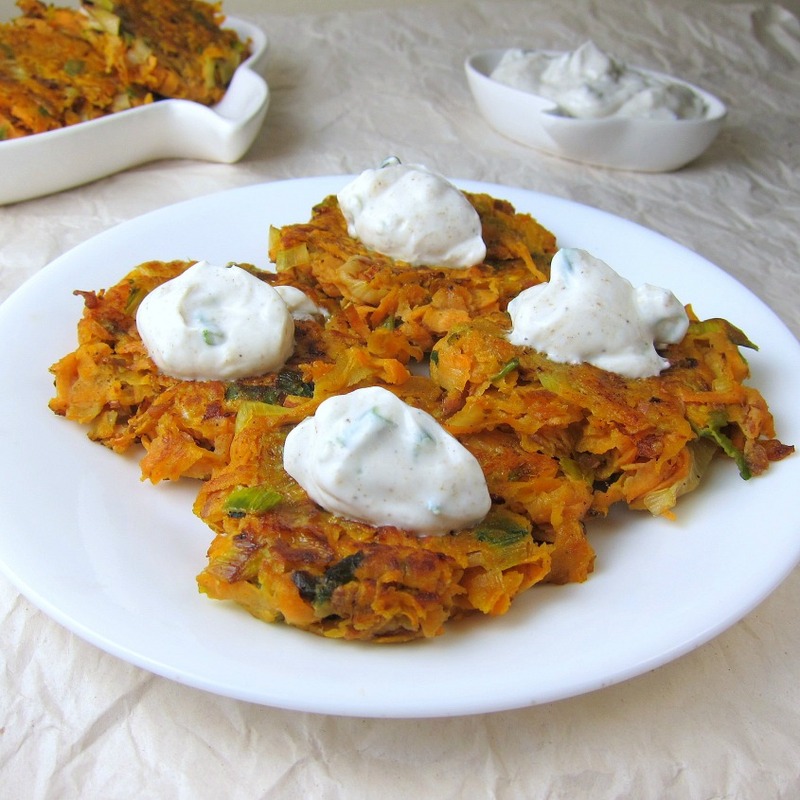 Shredded sweet potatoes are combined with sauteed leeks, and then cooked into crispy little potato pancaked. Topped with a cumin-garlic Greek yogurt sauce, this makes a really delicious, healthy, filling meal, side dish, or snack.